From community colleges and large universities to specialty colleges for members of the Sioux tribe, South Dakota has much to offer students looking to further their education. Career-oriented studies include agriculture, finance and high tech, mirroring some of the state’s key industries. Technology infuses the educational landscape, with online learning programs offering broad options for students seeking a variety of different degrees offered in flexible settings. Private and public universities both offer online degrees, certificates and courses, but public institutions provide more opportunities than nonprofit private colleges. Dakota State University, South Dakota State and University of South Dakota are some of the biggest public schools by enrollment, and their online programs reflect that breadth with multiple baccalaureate, graduate and certificate programs. While South Dakota offers some online learning opportunities for K-12 students, most of these students do not have a public, fully-online education available to them. The online education opportunities available in South Dakota make it an exceptional place for students of distance learning to earn their degree. Both public and private colleges and universities throughout the state have expanded their degree offerings to allow students the option of earning their degree either partially or entirely online—including baccalaureate, graduate and certificate programs. The breadth of online education options that make up the state’s higher education system provide students the opportunity to receive a quality education from an accredited school. 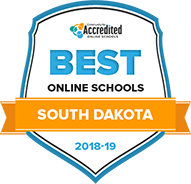 To learn more, take a look through some of the Best Online Colleges in South Dakota for 2018. Students at South Dakota State University can earn an online bachelor's degree in education, geography, general or interdisciplinary studies, health care or sociology. There are also minors available to online students. SDSU offers online master's degrees in areas such as chemistry, public health, educational administration or sociology. This college is part of Great Plains IDEA, which brings instructors from a network of 20 public universities to teach online courses. The early education undergraduate program and the graduate programs in dietetics, human sciences and sociology incorporate Great Plains IDEA. Students seeking licensure from their degrees can consult charts of state licensure requirements on SDSU's website. Transfer credits, out-of-class learning, previous opportunities and service and internships may apply towards certain online degrees. Northern State University offers undergraduate degree programs in finance, business, general studies and Spanish. Earning an online bachelor's degree in professional accountancy prepares students for certification exams for careers as Certified Public Accountants (CPA), Certified Management Accountants (CMA), Certified Internal Auditors (CIA) and Certified Information Systems Auditors (CISA). NSU also provides online graduate degrees in music education, general education, leadership and administration, and banking and financial services. Online students can apply previous credit towards some degrees, and all students are eligible for scholarships and financial aid. Dakota State University offers online degree programs at the undergraduate and graduate level that vary depending on the state where the student lives. Students can verify through DSU's website that they will be able to graduate in their state with a degree from their chosen online degree program. Transfer credits can be applied towards an online degree. Tuition is based on the number of credit hours a student takes, and online students can receive financial aid. The University of Sioux Falls is a private Christian college that offers online degree completion programs for undergraduate students in the areas of accounting, business or health administration. Current registered nurses can earn their master's in nursing through an online program, and USF also provides a master's in business administration entirely online, with focuses in health care and management. Educators can earn their master's degree in educational administration, higher education, technology or customized learning. Graduate degrees can be earned online in 2 years, and undergraduate degrees may be completed in 4 years or less, depending on how many transfer credits are accepted. Students who have a bachelor's degree in science or engineering, or professionals who have experience in a related field, can earn an online master's degree in engineering from South Dakota School of Mines and Technology. Online courses are offered synchronously, but students can choose to view lectures on their own schedule. There are 3 areas of engineering in which online students can focus: construction engineering and management, engineering management, or mining engineering and management. These programs can be completed in a year of full-time study. Online students are eligible for the same financial aid opportunities as on campus students attending SDSM&T. Dakota Wesleyan University offers an online Bachelor of Arts degree completion program, as well as a program for registered nurses to earn a master's in nursing. Students can also earn an online master's degree in education with a focus on education policy and administration, or a Master of Business with a focus in entrepreneurial and strategic leadership. Courses are self-directed, and online degrees can be completed in 1-2 years, with most degree programs accepting transfer credit from a student's previous college course experience. Online students can also receive financial aid through DWU. Black Hills State University offers several Master of Science online degrees, a Master of Education, and online bachelor's degrees in business administration with a specialization in management. Online students can receive financial aid and have access to academic advising and support services, the library, computer help, and other resources. Undergraduate degrees take 4 years of full-time study to complete. Transfer students can apply previous credit towards an online degree and complete a bachelor's in general studies through BHSU's online degree program. Students must maintain a 2.0 grade-point average in order to graduate. Do you need to transfer credits to a college? Which of the below best describes you? While supplemental online education is not offered to South Dakota students in grades K-5, some options are available in grades 6-8, and supplemental education is offered to most students in grades 9-12. There are no fully-online options for students in grades K-12, however, these students are not out of luck when it comes to access to online learning. The main online learning option in the state is South Dakota’s Virtual School (SDVS), which is a consortium of course providers approved by the state department of education. There are also a statewide virtual alternative school and other statewide programs that focus on career and technical education and advanced courses via SDVS. South Dakota has 31 colleges and universities serving 844,800 residents. The schools are a mix of public universities, community colleges, and private nonprofit schools. Also, since South Dakota has 11 residents per square mile – compared to the national average of 87 residents per square mile – it embraces online education options. Western Dakota Technical Institute offers three online associate degrees in addition to general education classes that students can transfer to other schools. Lake Area Technical Institute offers 12 degrees. In addition to these two online schools, the University of South Dakota, and South Dakota State University both offer online programs leading to various degrees. Large research universities, smaller technology focused universities and some tribal schools are included in South Dakota’s public college offerings. South Dakota State University offers 183 different fields of study complemented by 200 student organizations focused on developing students’ networking skills. Graduates represent the University of South Dakota across the state’s professions and account for 70 percent of attorneys, 48 percent of physicians and 50 percent of teachers in the state. Two South Dakota public colleges also cater to Sioux tribe members: Oglala Lakota College and Sisseton Wahpeton College. South Dakota is home to a number of community colleges offering career-focused programs including heating and cooling technology, power line construction and maintenance and medical laboratory technology. Given the state’s large agricultural production, courses in ranch management, large animal technology, farm power technology and horticulture technology are very popular. Students aspiring to work in corporate settings can access business programs including marketing, entrepreneurship, accounting and finance. These institutions report an employment rate of over 90 percent for graduates. Private nonprofit schools in SD are known for their scholarship and financial aid opportunities; at USF, 98 percent of students receive financial aid, including academic, performance and endowed scholarships and work-study jobs. Mount Marty College provides aid for 99 percent of students. Augustana College is known for programs in dentistry, law, medicine, occupational therapy, optometry, pharmacy, physical therapy and veterinary medicine. Athletics are an important part of student life as well, including baseball, softball, football, golf, cheerleading squads and booster teams. In addition to its sports teams, Dakota Wesleyan University and Presentation College offer sports-related degrees and career programs. While most online degree programs at SDSU are offered at master’s level, the online school in South Dakota does offer an associate degree in general studies and six bachelor’s degrees in general studies, interdisciplinary studies, social sciences, medical laboratory science, RN to BS and sociology. At the graduate level, programs include community development, dietetics, educational administration, human sciences and mass communication. Online certificate programs and individual courses are also available for students not seeking a full online degree program. Online courses are taught by the same professors as on-campus classes, giving students the opportunity to enjoy the same benefits as their on campus counterparts. All online students must apply for admission and students seeking a degree may be eligible for financial aid. Learn more about SDSU’s distance learning options by visiting: http://www.sdstate.edu/cee/distance/index.cfm. This online school in South Dakota boasts a robust online learning program with more than 36 degrees and certificates offered online. Undergraduate students can earn an associate degree in general studies or choose from bachelor’s degree options in disciplines such as addiction studies, business administration, health sciences and educational administration. Graduate student options have a wider range of degrees, including administration, music education and educational administration. Some specialized are offered through hybrid programs requiring some on campus participation such as comprehensive nursing or professional accounting. USD online students have access to the same support services as their on campus counterparts, including an orientation, writing center and advising resources. To expand opportunities further for nontraditional students, summer correspondence courses are also available in topics like cultural anthropology and world religions. More information about courses, programs, and student services can be found at: http://www.usd.edu/continuing-and-distance-education/index.cfm. DSU offers a comprehensive Office of Extended Programs to manage a range of online learning initiatives. With a focus on technology courses, DSU offers two and four-year degrees along with minors, so students can earn an online bachelor’s degree in computer science with a minor in computer and network security. DSU’s online graduate programs are focused in number but in tune with current career trends and broader business concerns, demonstrating an awareness of how online degrees could be leveraged in the job market. In addition to online graduate degrees in information assurance and computer security, DSU also offers an information assurance certificate focused on ethical hacking. Other programs cover health care administration, health information technology and medical coding skills. As an online school in South Dakota focused on science and technology, SDSMT emphasizes practical learning and professional preparation. The technical nature of the curriculum is well suited to the Desire2Learn online learning platform where students can attend courses online, via videoconferencing and through an on-demand option. Academic streaming video may be available for courses such as physics, industrial engineering, chemical and biological engineering, or chemical kinetics and reactor design. The school also offers online master’s degree programs in engineering management, mining engineering and management, and construction management. These graduate programs tend to utilize a blended delivery mode allowing both online and in-person participation. To suit the needs of students already working in the industry, classes may be scheduled once a week in the evening. Dakota Wesleyan University offers fully online bachelor degree completion programs in nursing and organizational leadership. Both programs are aimed at students who already have an associate degree. The nursing program is especially aimed at students who are working professionals and licensed registered nurses. Online students will participate in classroom discussions, turn in assignments and communicate with the faculty and other students. Students can develop relationships with other students and teachers in what the school calls its "digital community." The nursing program will allow students to get their RN certification upon completion and the organizational leadership program will prepare students to become effective leaders in the fast-paced business world. Presentation College offers two nursing completion courses and a radiologic completion program that will culminate in a bachelor's degree. One nursing program is for an LPN to BSN, and the other is for RN to BSN. LPNs must have graduated from a state-approved practical nursing degree program, and RNs must have graduated from a state-approved associate degree nursing program. Clinicals are done in Minnesota, North Dakota and South Dakota in the areas where students reside. Candidates for the radiologic program must have completed an associate degree or be registered with ARRT through a hospital training program. Students can earn their degrees while they continue to work in their specific health field. Northern State University offers a host of online bachelor's programs, most geared for success in business. The school offers 24/7 access to online courses. The small class sizes also mean more individualized attention. The faculty is available via phone, tablet or laptop. Students much take a placement exam before their online courses, or provide valid ACT scores. The school uses the learning management system Desire2Learn, which is used by all universities in the South Dakota regional system. Graduation requires a minimum of 30 semester hours of coursework at the school. Transfer credits are evaluated by the dean. The University of South Dakota offers a wide array of online programs across their colleges, from business to health science. The online school offers a host of students support services, such as testing services, academic preparation and technology help. The school uses the Desire2Learn portal for managing online learning. Students can choose from a range of emphases within certain programs. Also, students start as general students within their area of study, and the first two years are spent taking core courses both in general education and the major. Other programs may require students to complete a certain amount of credit hours before a declaration for degree completion. South Dakota State University offers a number of unique online bachelor's degrees like sociology and geography. The courses online are the same as the courses taught on campus by qualified faculty. All of the course material is accessed online through their online distance-learning platform, which was adapted specifically for online learning. The school is part of Great Plains IDEA, a collaborative effort between 20 public universities to deliver and develop online programs. Students enroll in their home institution, pay tuition through their enrolled institution, but courses are taught by faculty from any of the partner schools for the greatest access to qualified instructors. Black Hills State University offers online bachelor's degrees in business administration and general studies, which can be earned completely online. The online portal used to manage the programs is Desire2Learn, along with other major universities in the region. Through the Distance2Learn System, students participate in discussions, submit assignments via DropBox, take quizzes, communicate through course emails and view course content that the professor has posted for study. Some courses are offered in a videoconferencing format. Students in the business program gain a wide view of business knowledge, from marketing to economics to business law. Students in the general studies program can choose courses from three emphasis areas and general education requirements; it is geared for students returning to school who need to complete a degree, not first-time freshmen. South Dakota boasts some of the best post-secondary education for students who plan to serve their country. Many South Dakota schools work alongside Reserve Officer’s Training Corps (ROTC) programs, creating a multitude of degree choices for civic-minded graduate and undergraduate students. We’ve indexed the best online schools in South Dakota providing enrolled students with at least two of the following ROTC programs for the Army, Navy or Air Force. Accolades are to be given for the following school in South Dakota offering students affordable educational options in conjunction with service to their country. Students researching colleges and universities would do well to include the student/faculty ratios of online schools in South Dakota. For some students, learning is difficult when there are lots of students clamoring for help and it can be difficult to get assistance from their professors. The schools that follow deserve tremendous praise for keeping their student/faculty ratio below 20 to 1, some despite having student bodies above 5,000. Unlike many other places, the state has a huge amount of job openings. Data analysts, computer programmers, and engineers are in great demand in the state—and the online schools in South Dakota are ready to help their female students get those jobs. These colleges provide the very best for women seeking diplomas in science, technology, math and engineering. They each offer special programs and amenities for their female students, whether they be mentorship programs, more balanced classroom gender ratios or all-women residence halls for students studying on campus. All of these programs are ideal for women seeking success in both their academics and future professions. The state can be an excellent place of education for those hoping to bring both justice and opportunities to kids and families through social work. With expectations of rapid growth within the sector between now and 2020, online schools in South Dakota are well prepared to help students gain the academic qualifications needed to enter these fields. While most direct-service social workers need a bachelor’s degree, others, such as clinical social workers, are required to have a master’s degree. Those in South Dakota are allowed to be licensed and labeled as a social worker if they have a baccalaureate degree, two or more years of real-world training, and pass the state licensing exam. Those who obtain a master’s or doctoral degree in the field are eligible to be tested for a certified social worker license.